Two political events, World War I from 1914 to 1918 and World War II from 1939 to 1945 are so far the largest military conflicts in the history of the world, and their consequences decisively scripted the political and military balance of power in Europe and the world at large respectively. Both the wars were centered in Europe and both had common enemy factors. But there lie a number of differences between the two as regards dynamics of causes and effects. The rest of the article attempts to throw light on the differences between the two so-far biggest wars on the earth. The seeds of the first World War ware embedded in the political conditions and military balance that was facing the European society during the last four decades prior the war. Nationalism, imperialism, and interest-driven alliances provided fodder to pre-conditions to a major conflict. With the end of Turkish dynasty, the territory started to be appropriated by the major European powers and the Balkans & Turks were cornered in their land. At the same time of the history, Hapsburg dual dynasty of Austria and Hungary were threatened by growing agitation among the Slavs for either full independence or place in the government. The elite and ruling class of Austria and Hungary stood behind Autocratic Emperor Joseph. Germany readily supported the emperor as it was skeptical about Russia’s interest in a weakened Austria for their military interest in the Balkan region. England and Germany were competing with each other to prove their respective hegemonies in military control over the sea. Since France was apprehensive of Germany’s military adventurism, she took side of England. This made the alliance of like-minded friends; England, France and Russia. The whistle to a full-fledged war was blown by the assassination of Archduke Franz Ferdinand of Austria by Gavrilo Princip a Serb terrorist. The public perception was that of conspiracy of Serbian government behind the assassination. The Austrian government served to the Serbian government a humiliating charter of demand which when rejected by the Serbian government, Austria declared war against Serbia. This triggered a chain of actions among the alliances and by the first week of August a full-fledged war started. The seeds of the second World War were sown in the treaty of Versailles and watered by aggressive imperialistic and colonizing attitude of the major nations of Europe and failure of League of Nations to stand-up to its mandate of peace keeping. The people of Germany considered the treaties of Versailles, signed between the allies and Germany after her defeat in World War I, grossly biased against the interests of Germany. She had to concede large parts of her territories and colonies, and France forcibly took away some of her coal and iron rich zones. Thus, for Germany it inflicted twin injury; political and economic. Alliances of imperial forces again swung in to action. Britain and France on the one hand focused on protection of their respective colonies and on the other hand held out to prevent Germany and Italy from fulfilling their imperialistic aims. In Germany, failure of the Democratic Socialist party to address the burning public sentiments resulted in electoral drabbing of the ruling party in the hands of Nazis, and in 1934 the great dictator Adolf Hitler, the leader of Nazi was sworn in as the Chancellor of Germany. Japan, in her effort to save Asia from invasion by communism, controlled a major part of China, and got full support from Germany and Italy. Mussolini, the dictato- president of Italy conquered Ethiopia which was supported by Germany and opposed by England. Hitler’s overwhelming desire to rule the whole world combined with undiluted hatred towards the Jewish community compelled him to attack Poland in 1939, and this triggered the World War II between the Axis block consisting of Germany, Italy and Japan and the Allied forces of England, France, USA, China and Soviet Union. Approximately 22 million people were killed in WW I, out of which 13 million were civilian deaths. Germany and Russia were the worst sufferers with 2 million casualties in each side. WW II resulted in death of roughly 50 million people including 10 million non-combat deaths. Soviet Union and China bore the major brunt of it. The WW I was essentially Europe centric with the major European powers were at conflict, while USA joined hands with the allied forces in 1917. But another dynamic was added to the WW II. Powered by economic prosperity and stability during 1930s, Japan nurtured imperialistic ambitions with focus on East Asia. Japan’s aggressive maneuvers instigated allied nations in particular and the US in general, and forced them to defend their political and strategic interests in Asia against Japan’s imperialistic design. The enormities of both the wars were such that the regular army of the conflicting nations fell short in demand, and as such voluntary and compulsory participation by public in combat zones as well as combat-support services were necessitated. But here lies one crucial difference between the two wars; in case of WW I public opposition to the war was more pronounced. Highly influential personalities like Bertrand Russell of England and Eugene Debs of USA led anti-war campaign. Surprisingly this collective public conscience was reduced to insignificance during WW II, probably due to blatantly anti-humanity actions of Hitler led military and secret services. Many viewed WW II as poetic revenge against Hitler. This is the reason WW II got more support than opposition from the people of the allied nations in particular and the world population at large. Both the wars saw ethnic genocides. In WW I the Ottoman Empire carried genocide of Armenians. But during the WW II Nazis carried out more deadly and ghastly genocide of Jewish people in torture chambers and gas chambers. Millions of Jewish women were tortured and raped to death by Nazi criminals, German military and Gestapo. Methods and techniques of war were much more sophisticated in WW II as compared to WW I. During the first war, battles were fought mostly on ground with focus on infantry. Machine guns and tanks were mostly used with little aerial support. In some pockets poisonous gas was also used as weapon. WW II, on the other hand witnessed a technological leap-forward in this respect. Fighter planes, missiles, nuclear powered submarines, heavy tanks were used both by the axis and the allies. The first WW is often referred to as trench war as significant time was spent by the combat forces fighting from the trenches. 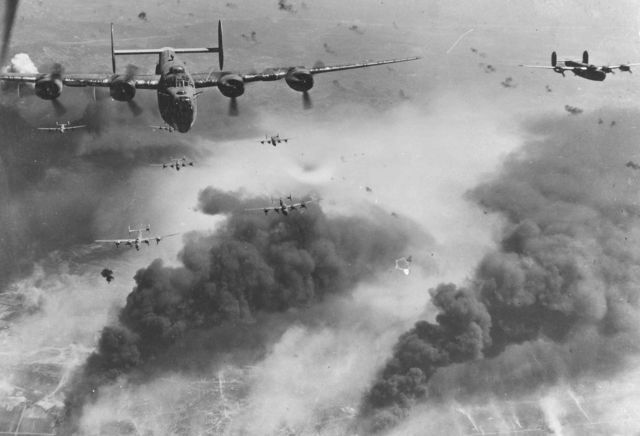 But during the WW II, the forces with superior air-force clearly derived advantage in fighting enemies. The blitz-Krieg technique applied by Germany almost ameliorated a number of British cities. The outcome of the WW I was defeat of Germany, Austria and Hungary, and Austro-Hungarian empires ceased to exist. League of Nations was formed to prevent any future conflicts among the participants. The WW II ended with the defeat of Germany, Italy and Japan in the hands of the allied forces led by USA and Hitler killing himself in bunker. League of Nations was replaced by United Nations. During the WW I, US under the leadership of Woodrow Wilson joined the war only at the later part of the conflict. But President Truman was more pro-active during the WW II and not only participated in the war but admittedly brought victory for the allied forces. The only-two nuclear bombs so far used in human history were dropped by USA on the Japanese cities of Hiroshima and Nagasaki, with un-imaginable consequences. The main reason of first war was the conflict of imperialistic interests of the major European powers, and was triggered my mistiming of assassination of Austrian heir-apparent. The reason of second war high ambitions of Hitler and imperialistic maneuvers by Japan. Much more human casualties happened during WW II than WW I. Public opposition to war was much more pronounced during the first war than during the second. The second war witnessed wide-spread genocide in comparison to the previous one. tapas. "Differences Between World War I and World War II." DifferenceBetween.net. September 27, 2017 < http://www.differencebetween.net/miscellaneous/politics/differences-between-world-war-i-and-world-war-ii/ >. first, in the Weapons section – you probably mean in WW2 they had submarines (which they also had in the first ww) and the nuclear bomb – but they didn’t have nuclear-powered vessels until much later. You might mention they had jets, though. second, in the Leaders section, no mention of Roosevelt – who was an early supporter of going to war to aid the British. When I catch these types of rather glaring errors it makes me question the value of the other explanations I’ve read.